Adapting to a paperless culture is great for the environment and comes with numerous benefits. The writing is on the wall. 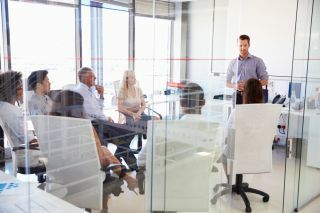 It’s from a shared, cloud-based document displayed from a laptop that’s wirelessly connected to the SMART Board mounted at the head of the conference table, and it says businesses benefit greatly by becoming a paperless environment. Making the move towards digital workflows has come with each technological breakthrough. Personal computers, wireless internet, smart phones and cloud-based networks all played their part in chipping away at the stacks of paper in the filing cabinet. Today, the majority of offices we work in are positioned to permanently make the move away from paper, but hold back because they stuck in the way they have always done things. If this is your thinking, take some time on Earth Day to consider these five benefits that come when you say goodbye to paper. Being responsible about limiting the amount of paper your organisation uses will conserve resources and ultimately save money in the long term. Converting as many processes as possible from paper to digital will cut down on resource consumption. Adopting software to allow employees to fill out forms or sign documents electronically is a great way to reduce unnecessary printing. While eliminating paper might not be an option for all, there are still ways to manage the use of office supplies more effectively. Businesses can take control of their paper consumption by adopting print management software. This will allow companies to track printing costs and set parameters to print efficiently only what is needed. A recent survey commissioned by Xerox revealed 46 percent of responding small and medium sized businesses waste time daily because of paper-intensive processes. Converting all paper to electronic files will optimise both the creation and comprehension of these documents. With the files converted to digital documents, employees can electronically search, edit and modify the information they need to get work done. People are also able to work on these projects simultaneously and storing these files on the cloud ensures access in and out of the office. Companies also need to factor in how much time is wasted printing by documents before meetings or making copies to distribute around the office. This is time many are trying to take back. More than 80 percent of the respondents to Xerox’s survey said they want to streamline paper-based workflows in 2017. Information is the most valuable asset companies own, and the fact is, despite recent headlines of cybersecurity threats and hackers, paper-based data is one the most vulnerable for interception or loss. Moving away from paper will tighten security and protect valuable information. Natural disasters or unexpected accidents like a fire are not only damaging to a company’s physical location, but cause permanent damage. According to the Federal Emergency Management Agency (FEMA), “Forty percent of businesses do not reopen after a disaster and another 25 percent fail within one year.” Paper files and the information they hold can be permanently lost in the event of a natural disaster. Moving all this valuable information to a cloud-based network can ensure its protection. Printing is a major security hazard as well. Studies show 20 percent of print jobs are never retrieved from the printer. This can leave sensitive information unprotected and susceptible to accidental interception or distribution. Eliminating the need to print will take out this risky step of the administrative process. According to Pew Research Center, millennials became the largest percentage of the population in 2015 and also became the largest generation in the labour force. The new majority is bringing with it new trends relating to technology in the workplace and environmental impact. Employees born between 1981 and 1997 are the first generation to come of age during the era of the internet. A PwC survey found that 78 percent of millennials believe access to technology makes them more effective at work. Adopting digital workflows and converting as many processes to as possible to paperless will set up the new majority for success. Eighty-eight percent of respondent millennials to the PwC survey said they were looking for an employer with corporate social responsibilities that matched their own. Concerns about the environment weigh heavily on this generation, and a report by The Glass Packaging Institute showed 83 percent of millennials believe being eco-friendly improves quality of life. Being able to tout a paperless office will position employers to more easily recruit the new majority of the changing workforce. Working from home or elsewhere outside the traditional office is becoming a popular option for employees, as 80 percent consider telework a job perk. Cloud-based networks and the ability to access documents from anywhere have increased the viability of remote work for many companies. To ensure maximum productivity of mobile workers, organisations need to adopt paperless workflows and equip their employees with tools to support these processes. Applications like electronic signatures, which allow employees to sign documents digitally, and mobile capture, a technology that uses smart phones or other mobile devices to take a picture of paper documents and produce a working digital copy, can eliminate the need to print, scan and fax papers from the home or office. The benefits of saying goodbye to paper don’t end there. Cutting down on clutter and getting organised are great ways to improve employee morale and lower an office’s overall stress level. The best businesses adapt to changing environments, and evolving towards a paperless culture will change your company for the better and lay the foundation for future success.